Whether you’re tubing down the San Marcos River or taking in a college football game at Bobcat Stadium, families enjoy doing things together. At San Marcos Gentle Dental we have the same idea. 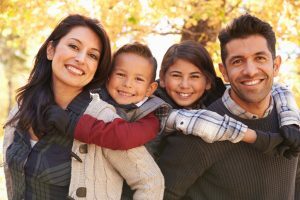 We’ve created a unique practice that serves the entire family—from the tiniest one to the oldest—we are here make your life and your dental needs a lot simpler. You will find at your dentist in San Marcos a group of professionals that are committed to providing a range of services to fit each family member’s individual needs. At San Marcos Gentle Dental, we strongly recommend having regular checkups and cleanings. Two visits per year can provide early detection or prevention of dental issues such as gum disease, tooth decay and teeth grinding. With a simple tool like DIAGNOdent, we can detect the formation of cavities in hard to see spots, which means we catch it before it becomes more serious. A smaller filling is easier on you and also helps to keep more of your healthy smile intact. Dental sealants: Since the back of the teeth take the brunt of the chewing and frequently get food stuck in between, a dental sealant can provide protection. We apply a small amount of liquid that dries and forms a thin barrier between the teeth and the bacteria that causes cavities. Fluoride: Applied as a mouthwash, fluoride protects the teeth by attracting good minerals that help strengthen the enamel. Teaching: Dr. Donnelly can provide plenty of oral tips and advice on caring for your teeth, which will help both children and parents. Cosmetic Dentistry: We can help you alter the appearance of your smile by restoring, straightening and whitening your teeth. We offer crowns, Lumineers, porcelain veneers, tooth colored fillings, Invisalign braces, and Zoom! Whitening to bring back that bright smile. Restorative Dentistry: Missing a tooth or several can severely detract from your smile. Depending on your needs, we offer dental bridges, implants or dentures that will restore your smile and also help you maintain good oral health. Sedation Dentistry: For those who experience some anxiety when going to the dentist, we offer a safe and simple option so that you won’t put off getting the care you need. Dr. Donnelly will prescribe medication you can take before you arrive so that your visit will be comfortable and stress-free. Laser Dentistry: Laser dentistry is a newer development in dentistry that can reduce a patient’s need for anesthetic, decrease healing time, lessen discomfort and bleeding, focus on smaller areas needing therapy, and create a smoother atmosphere due to less noise and vibration of traditional tools. Sleep Disorders: It’s hard to imagine that dental problems are occurring even when we sleep, but teeth grinding can be a real problem once you are awake. Chronic headaches or migraines may result from clenching and grinding your teeth at night. TMJ therapy can remedy this by creating a custom-fitted nightguard to prevent the posterior teeth from touching one another. Another type of mouth guard referred to as a snoreguard can also help with sleep apnea, which can lead to many serious health problems. San Marcos Gentle Dental is proud to offer a complete range of services for the entire family. From family dentistry to dental implants, we are here to meet your every need. If you have questions or would like a consultation, please don’t hesitate to contact our office today.